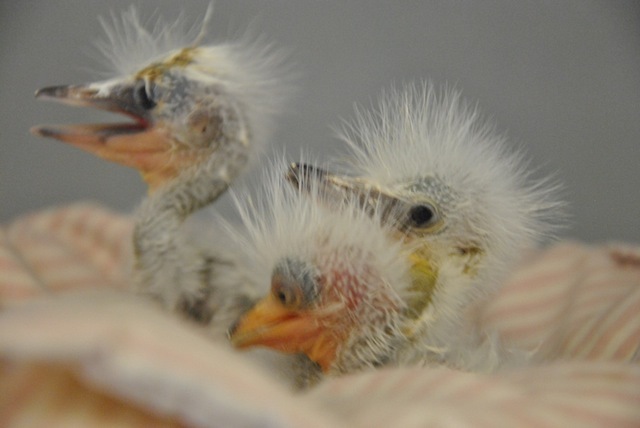 Snowy egret chicks are cared for until they're old enough to fly at IBR, then released in the wild. Photo by Kylie Clatterbuck. Rehab is often in the news, but it’s most often associated with some celebrity figure. 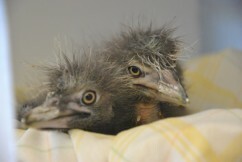 This time, though, the celebrities were 22 orphaned egrets and herons from Santa Rosa, CA. Twenty-one of the 22 media darlings were from the Ninth Street Rookery. Young egrets and herons that leave the nest before they’re fully flight-ready are usually taken care of by the parents on the ground or climb back up into the trees on their own. But this rookery, which sits in the median of a very busy street, has many cars and other urban threats that could potentially harm its birds. Black-crowned Night Heron chicks, snug in their nest at IBR. Photo by Kylie Clatterbuck. Even with last week’s release of the young birds, IBR in Fairfield still has 41 more snowy egrets and 23 black-crowned night herons that will require care until they’re ready to be returned to the wild. Last week’s rehabbed fledglings were released “en masse” in the Laguna de Santa Rosa, which is in the same watershed as the Ninth Street Rookery. They wear a numbered red leg band so scientists can try to track them through the years. Perhaps they’ll join the Ninth Street Rookery in the future or maybe they’ll disperse to other locations. If you notice a heron or egret with a red band on its leg, try to look for a number (usually a spotting scope or telephoto lens is required) and report it to IBR. You may be able to help contribute to the life story of one of these rehabilitated birds!